Posted on Sun, Apr 8, 2012 : 6:42 a.m. I have always loved asparagus. But the minute I tasted grilled asparagus, it went from a vegetable I liked to one that I was madly in love with. Every time I make it — seasoned with my basic grilling trilogy of olive oil, salt and pepper — people ask for the recipe. That's because grilling transforms the asparagus so much that most people think I am pulling their leg when I tell them it has just those ingredients. Most people don't realize what a powerful flavor enhancer the heat of the grill is. And this simple recipe really shows just how powerful it is. It works because the high heat of the grill causes the natural sugars in the asparagus (as well as many other vegetables) to caramelize, accentuating its nutty, sweet flavors. Though asparagus is available all year long, it's a sure sign that spring is here when the local asparagus begins to arrive at the grocer. I prefer the thick bottomed stalks that snap instead of bend with tight tops and a plump green look to them. Asparagus also comes in white (popular in France) and purple varieties, but I think the green variety is more tender, sweeter and usually is less expensive. If you crave thin asparagus, save it for the saute pan. It's much too delicate to hold up to the grill. In fact, for grilling the thicker the stalk the better. I usually buy asparagus the day I am going to cook it, but you can keep it fresh in the refrigerator the same way you keep parsley fresh — cut off the bottoms and place the entire bunch upright in a glass of water, similar to a bouquet of flowers. When you are ready to cook it, you need to trim the bottoms. You have two options. You can snap the stalks one at a time. Or, if you've kept the bunch intact (usually held tight by a rubber band), lay it on its side on the cutting board and use a knife to cut just below the band. I then wash my asparagus, dry it and place it in a zip-close plastic bag. Drizzle olive oil in the bag, seal it and "massage" the stalks so that all the exposed surfaces have a light coating of oil. This is essential for juicy grilled asparagus. Otherwise, it will dry out and might stick to the grates. My motto — oil the food, not the grates! Grilled asparagus needs no adornment to enjoy, but in honor of spring ham I am wrapping the room temperature grilled asparagus with translucent slices of Prosciutto for an antipasto appetizer all in one bite. You can take it even further and dress it up as a gorgeous salad with a dollop of buratta or fresh mozzarella and a drizzle of olive oil, coarse sea salt and cracked black pepper. Either way, it's the perfect way to celebrate spring! Look for fat firm stalks with deep green or purplish tips. Also check the bottom of the spears. If they are dried up, chances are they have been sitting around for too long. Trim off the tough bottoms of the asparagus spears. You can use a knife and cut them roughly two-thirds of the way down, or by hand. For the latter methods, one at a time, grasp each stalk by both ends and bend it gently until it snaps at its natural point of tenderness. Wash and dry the spears. Place the asparagus in a large zip-close plastic bag. Add enough oil to allow you to massage the spears and coat them entirely with olive oil. Sprinkle with salt and massage again. Leave the asparagus in the bag until ready to cook. Place the asparagus on the cooking grate crosswise so they won't fall through. Grill for 8 to 12 minutes (depending on the size and thickness of the stalks), turning occasionally to expose all sides to the heat. The asparagus should begin to brown in spots (indicating that its natural sugars are caramelizing) but should not be allowed to char. Remove from grill and let cool to room temperature. 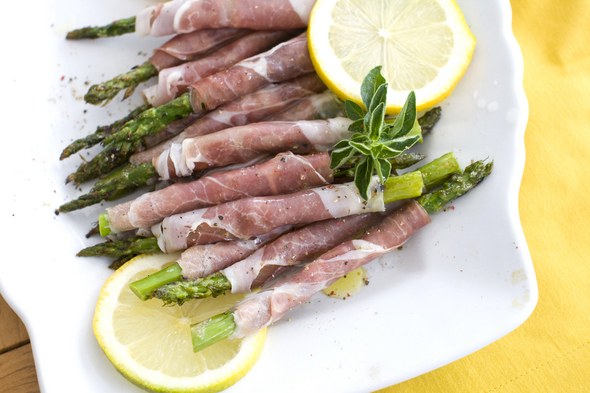 Wrap each stalk of grilled asparagus with a thin piece of prosciutto. Serve immediately. Nutrition information per serving (values are rounded to the nearest whole number): 120 calories; 70 calories from fat (59 percent of total calories); 8 g fat (2 g saturated; 0 g trans fats); 20 mg cholesterol; 3 g carbohydrate; 9 g protein; 1 g fiber; 1,000 mg sodium. EDITOR'S NOTE: Elizabeth Karmel is a grilling and Southern foods expert and executive chef at Hill Country Barbecue Market restaurants in New York and Washington, as well as Hill Country Chicken in New York. She is the author of three cookbooks, including "Soaked, Slathered and Seasoned." Sun, Apr 8, 2012 : 3:41 p.m.
Asparagus is an excellent vegetable and, if prepared properly (I prefer to roast it), quite tasty. It is a very good source for folic acid, among many other nutrients. See http://www.asparagus.org/maab/nutrition.html for more information (maab stands Michigan Asparagus Advisory Board). Sun, Apr 8, 2012 : 2:16 p.m.
Asparagus is hopeless. Even raccoons won't eat the stuff. Google &quot;Babe Ruth&quot; and &quot;asparagus&quot; and you'll find that the Bambino pretty much summed up this vile weed. Sun, Apr 8, 2012 : 12:57 p.m. I use the same method and I generally do mushrooms, onions, peppers, and potato. I also use a little garlic powder and Italian herbs in the gallon bag. The grilled veggies go with almost anything being grilled. The mushrooms, onions and peppers are sweet and juicy. But the asparagus is by far my favorite! And the fatter stalks work better than the skinny ones on the grill!